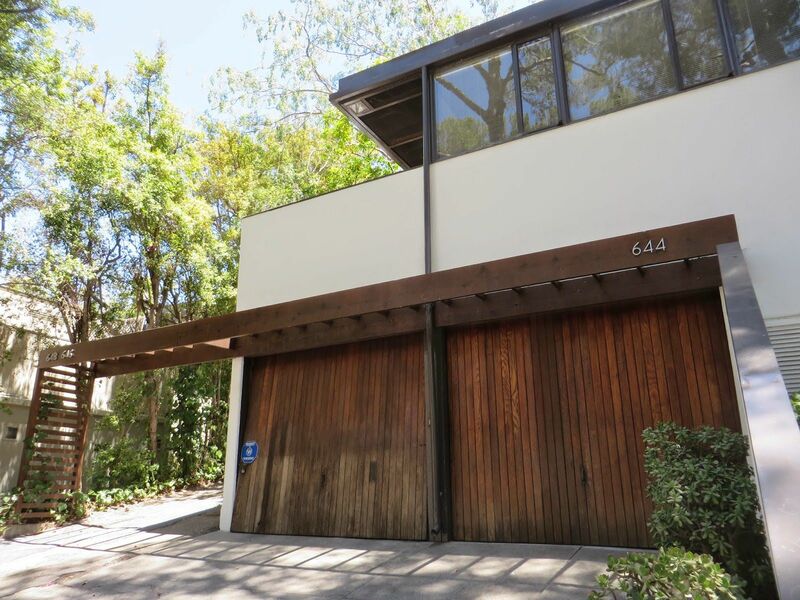 Posted: Fri Jan 25, 2019 9:41 pm Post subject: Mid-Century Structure? I'm researching mid-century architecture and the use of exposed structure. Think of Neutra's spider legs. Is there any great wisdom out there on the origins of such structural tricks? Why they were in vogue from '45-55? And what benefits they provided to a design? (One drawback was that wooden beams exposed to rain eventually rotted). can be given top-side cladding of copper or other material; see Greene & Greene for some impressive examples. I believe you'll see the comparable detail in Neutra. large -- but the international Art and Crafts, followed by the European Constructivists (think Rietveld, for instance), found the primal joy inherent in structure-as-decor, as aesthetic and functional raison-d'etre. that he was dealing with the "skeleton" of the building . . . Yes, preservation often involves metal or dutiful application of new stain or paint on a regular basis. And there's the fact that most mid-century houses probably weren't intended to last beyond 50 years. The most obvious ancient precedent is the flying buttress...if you can call that ancient. But where did Nuetra's spider legs come from? Was he the first of the last century? And was the purpose behind them to...what?...free up a corner for more glass maybe? have, than a row of openings divided by structural (or non-structural) posts, with the simple and direct meeting of two such planes at right angles at an identical post ? And what is different, there, from the the Greek temple, where all columns are identical (along with, typically, the spaces between them) -- including the corner one ? That temple is the first self-conscious expression of the post and beam structure. It is a very short trip from Greek temple to Case Study post-and-beam residence. on its merry way, corner post be damned . . . The spider leg plays Wright’s game but turns it inside out. 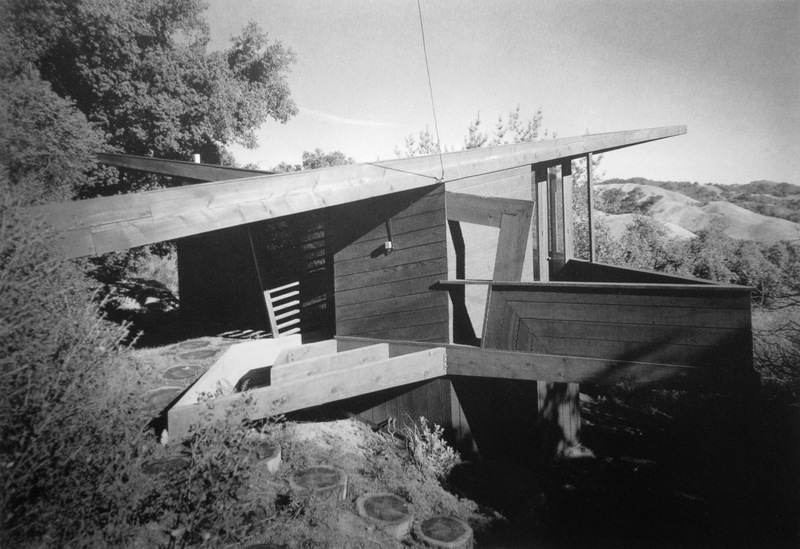 Wright brings the final post in from the corner, and cantilevers the roof. 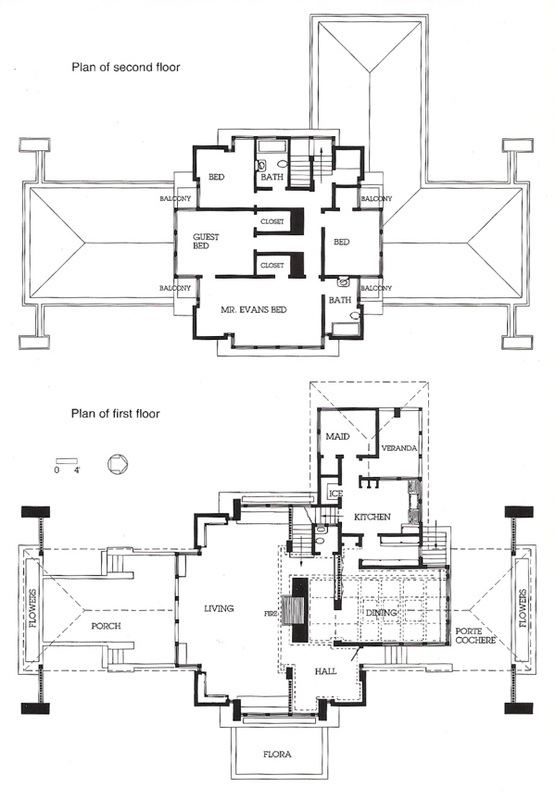 Neutra moves the post beyond the corner, extending the house into the garden, allowing a massive corner window. I must say, Neutra’s solution truly makes the corner seem to disappear, at least when seen from the interior, much more so than Wright’s. Within the context of modern architecture, it’s possible to attribute this innovation to Neutra. Post and beam was never Wright’s thing. Thanks so much to both of your. Really clears away the fog for me. Never thought of that inversion of Wright's internal supports that result in a corner cantilever, with Nuetra reversing that. I'll pull some Nuetra books off the shelf and see when he did this first. FLW's one venture into a sort-of spider leg - which I call outrigger - was at Evans, where hefty piers are placed beyond the porch and porte cochere, connected by long beams supporting the roof structures. It's a more grandiose approach, but accomplishes the same thing. As for exposed wood, a few of the 11th century Stave Churches of Norway (Borgund, Gol og Heddal, e.g.) have survived. Most that haven't, burned. I haven't looked at those; I assume that the structural members are protected in one way or another. In the modern all-wood building, shingles or other renewable surfaces do that job. 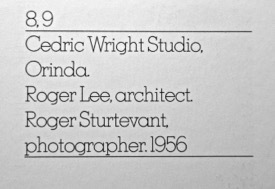 I would be interested to know when Neutra first showed his spider-leg. Didn't I recently see a house with two of them ? 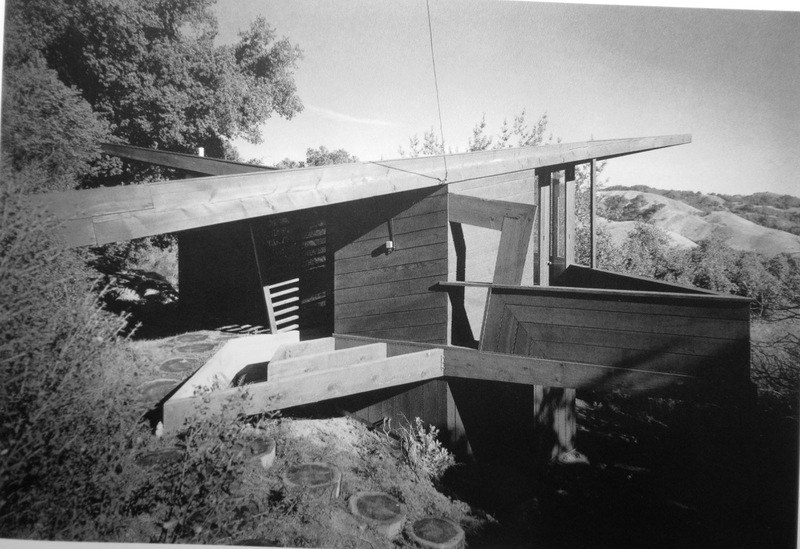 Hines' book on Nuetra has a photo of the "Earl Street Reunion House" of 1949 with classic spider leg or outrigger supports (page 208). There is a sort-of spider leg in the Kelton apartments of 1942 but it doubles as the support of a trellis. The Kaufmann House of '46 has external supports, but they appear to be more conventional columns that don't have that distinctive turn from horizontal to vertical. An interesting detail about the outriggers on the Perkins House of 1955 is that the vertical support seems to be notched so that the outer side continues up to cover the end of the horizontal. It's an important detail to help convey the "turn" from horizontal to vertical. The same effect could have been done with a miter corner, but that would have been a lot less structurally sound. Good find. I think we'll see several means of making that corner, in Neutra, over time ? Coincidentally, that same joint appears in this delicious mystery from pp 76-77 of "NorCalMod," Pierluigi Serraino, Chronicle Books, 2006.
. . . or straightened, to make the verticals plumb. Takes away that extra little bit of drama . . . 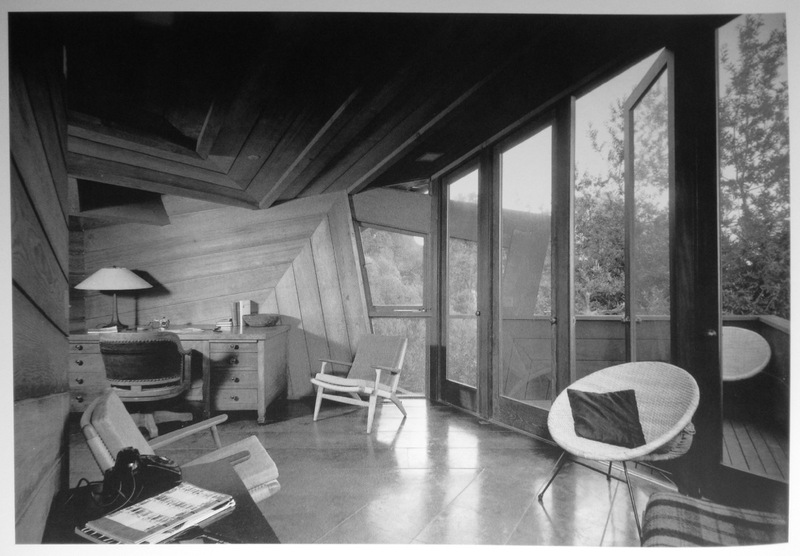 If the Rosenbaum Picture is of a wooden UFO, this cabin might be the shuttle or landing pod. of the living room, in the two photos . . . so, twin triangular decks ? Not positvie but pretty sure I've never heard of the Evans house before. ... corners of main block like UnityT. It isn't one that comes up much. The differing bays on the two floors -- three square windows below, four above -- amuses me.